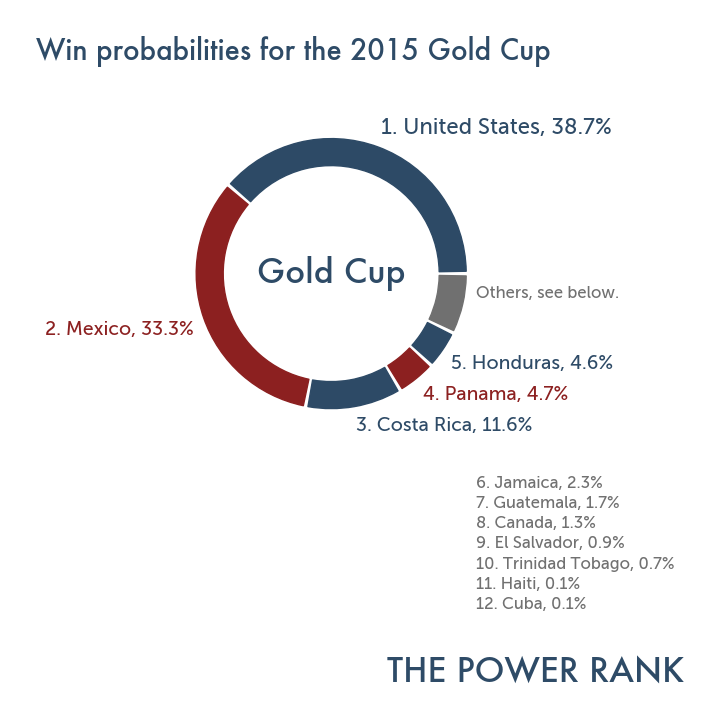 Can the United States win the 2015 Gold Cup? Winning the Gold Cup means more than than just bragging rights over rival Mexico. With the win, the United States qualifies for the Confederations Cup in 2017, a key tune up tournament for the World Cup in 2018. 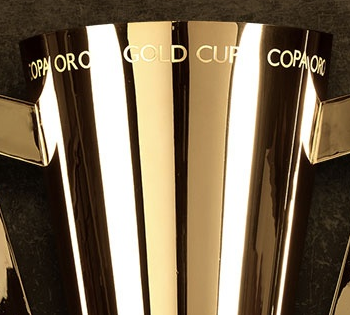 If another team wins the Gold Cup, they play a one game playoff against the United States, winner of the 2013 Gold Cup. The winner of this playoff represents North America at the Confederations Cup. To determine win probabilities for the Gold Cup, I combined three different estimates into an ensemble prediction. Two came from my own calculations that rank international teams on offense and defense (see the bottom of this article), and a third came from the markets. The Gold Cup usually comes down to the United States and Mexico, but Costa Rica has emerged as a solid third team that made the final 16 of the World Cup last summer. Let’s look at these three top contenders. The offense and defense rankings come from The Power Rank algorithm and use international matches since January 1st, 2011. The United States looked fantastic in beating Germany in a friendly last month, and they also beat the Netherlands in another friendly. Both matches took place on European soil. They need to play well at the start of the Gold Cup as their group has Honduras and Panama, two top 50 teams in my world soccer/football rankings. Meanwhile, Mexico has the dregs of CONCACAF (Guatemala, Trinidad and Tobago, Cuba, all ranked lower than 80th) in their group. Coach Jurgen Klinsmann left central defender Matt Besler, who started every game of last year’s World Cup, off the Gold Cup roster. John Brooks will most likely start, and let’s hope they can improve a defense that has ranked 27th in the world over the last 4 years. By the numbers, Mexico has a slight edge on the United States in my rankings. They don’t have the largest win probability though since the United States will enjoy home field advantage. I’m not 100% certain the United States should get the full .59 goals for home field. If the United States and Mexico meet in Philadelphia for the final, there will be plenty of Mexican fans wearing green in attendance. In my ensemble calculations, the market predictions most likely account for the semi-neutral type final in Philadelphia. They gave United States a 38% win probability with Mexico at 36%. The gap was bigger in my two calculations. For Mexico, striker Javier “Chicharito” Hernandez broke his collar bone and will miss the Gold Cup. He scored 9 goals in 33 matches for Real Madrid last season. Costa Rica had an amazing World Cup last summer. In winning their group, they sent Italy and England home before the knock out stage. Then they beat Greece to advance to the Round of 16. Costa Rica relies on its defense, which is ranked 10th in the world over the last 4 seasons. They face a road game against Canada in Toronto in the group stage, but they should win their group before most likely playing the United States in the semi-final. 10. Trinidad and Tobago, 0.7%.